In Food & RestaurantsTags #lifelife, #vanlife, food, Los Angeles, recipes, restaurants, salads April 27, 2017 L.R. 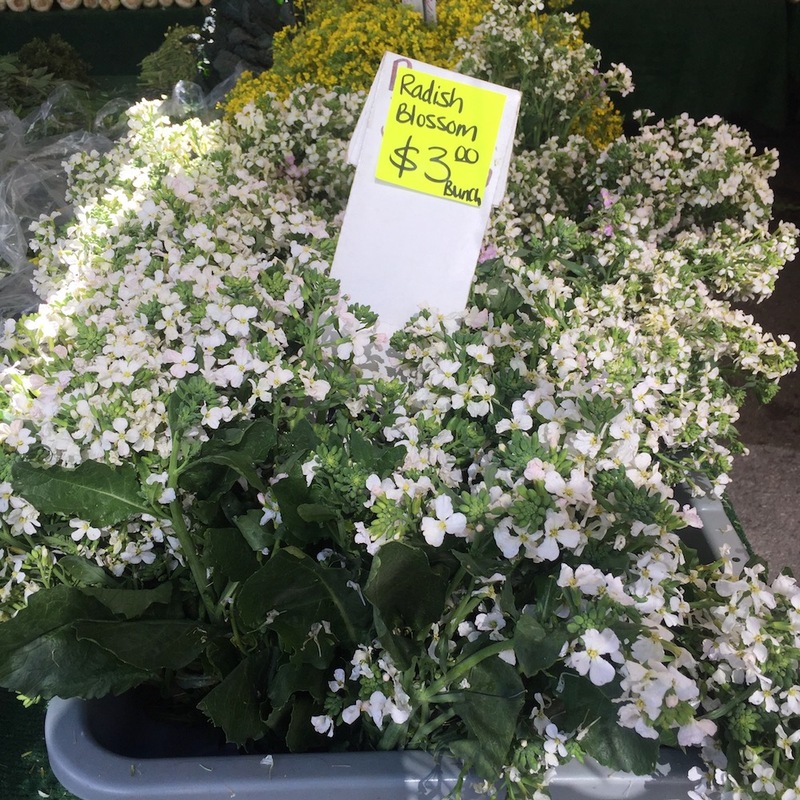 If you happen to read some of my other posts and the chronology seems confusing (for example, I’m not in LA right now), note that I wrote this a month ago but was waiting until radishes were definitely at the Boulder farmers’ market. Sometimes I wander around the farmers’ market and pick up this or that, not really knowing what I’m doing, like I’m senile almost. I might have one dish in mind and I’m consumed with finding perfect complements, or I simply might not know what I want. Once I started eating whole-foods plant-based I had fewer spells because almost any fresh vegetable tastes great when it’s chopped up and tossed with other fresh vegetables. A little or a lot of vinegar, maybe a little oil, and definitely hot sauce. But when I saw these beautiful radish blossoms, I knew that even though I’m living out of my minivan, I would finally try to make my favorite salad in the world: the Spotted Pig’s radish salad. At your own risk of not gaining the illumination of some aspect of your own life that great literature often provides, click here to skip to the recipe narrative, or here just for the recipe. Come midnight or 1am I was hungry and thirsty, and there’s a service industry phenomenon of getting off work and wanting to be taken care of by someone else. New York City had a handful of restaurateurs who catered to this market; it would be fun and maybe disheartening to see a flow chart of dollars because often the employees of one restaurant would spend their same-night earnings at a sister restaurant. One night at the Pig I was blessed with having the radish salad. I don’t know if I ordered it because I liked radishes or if I now love radishes because I had the salad and loved it. It wasn’t an aha moment – I don’t remember the first time. I don’t remember the first time I saw the first woman I loved either, but once I loved her, I loved her for certain. When you know, you know, and from then on it was hard for me not to order the radishes if they were available. I was obsessed. What I don’t remember but sounds right, prompted by a Google search: arugula and basil. More of what I remember: entering the cozy wooden bar area and sometimes needing to wait for a stool. If it was “early” (midnight), enjoying a beer or two while reading the New Yorker (that Sisyphean task). My second night there making fast friends with fellow New Yorker reader Laura, who could talk design from both academic and practical standpoints. Chatting with the bartender on duty, hopefully Kristin or Amy, about life and about what to order. Having food arrive and ordering wine to go with it – bite and sip, right? – then finishing food and switching back to beer, shot of Fernet (bitter Italian herbal digestive liquor) on the side. By then the slightly wacky pantry chef Andrea would be enjoying a shift drink at the bar and I asked her more than once for the lowdown on that radish salad. What’s in it exactly, what’s the process? What I learned was that as with anything worthwhile, it’s simple but not easy, even in a restaurant kitchen with all the ingredients ready. Turns out that the key to the salad is a time-consuming massage of the radishes with the lemon oil, basil, and cheese. Andrea would make the motion of opening and closing her fists when she talked about it. The more care taken with this step, the better the salad. It got so that depending on how good my salad tasted, I could tell if Andrea was in the kitchen – no one else seemed to understand how crucial this step was even though Spotted Pig Chef/Owner April Bloomfield talks about it at length in her cookbook. I’m sure it’s hard to take time when you have three or ten tickets on the board, but it seemed to be the difference between making it correctly or incorrectly. Until the other day I only knew secondhand. There are several challenges of #vanlife cooking – or, shall we say, food preparation. I don’t have a refrigerator, I have a cooler that my roommates and I found in our attic when we moved out of our house on Pine Street in Boulder. It has a fun bas-relief of a fish on it with a ©1992, which would make it a contemporary of my 1994 Toyota Previa. But what really stops me from making food is I don’t have a place to prepare it. Not counters and sinks – though not ample, I have cutting boards and flat surfaces and water, and for two years I turned out all sorts of complicated dishes from the galley of a 32′ sailboat, and my NYC apartment’s kitchen was only slightly larger than that. What I mean is that when I’m parked in a residential area I’m reluctant to throw open the doors of the van and expose myself as a vanlifer to the dog-walkers of the neighborhood. First things first: I’m not a “lifer” in the sense that I intend to live out of my van for the rest of my life. (“Vanlife for LIFE, man!” No no no no no.) I’m a “vanlifer” in the sense that right now I’m someone who chooses to live out of and sleep in a van. Not even a van. A minivan. Circumstances that led me here include a newfound appreciation for targeted frugality, an unwillingness to work in an emotionally and spiritually oppressive environment, and not knowing what my next purpose is with this particular life, to the point of occasional moments of anxiety and floatiness. I don’t really know where I want to live next. I get that people of all ages have these feelings sometimes; I’ve been fortunate that for much of my life I’ve had a sense of direction: NYClife, sailboatlife, restaurantlife, mtblife. And I’m definitely grateful for lifelife. But I find myself here at 44 years old feeling what I imagine a mid-life crisis feels like. Maybe that feeling of unsurety is why I don’t want to be seen by the local homeowners as a vanlifer. Also, I don’t know the specifics, but it recently became illegal to live in a car in Los Angeles and I don’t want to do anything such as prepare elaborate salads that might generate phone calls. I think the first offense is only a $25 fine, but still… . It’s like wearing sunglasses indoors when you have something to hide: people might suspect that your eyes are hooded or bloodshot or you have a black eye, but maybe your shades are prescription, right? Working for six months from September to March I was borderline depressed for much of the time. I was possibly over-the-borderline depressed but I don’t want to insult people who suffer from chronic long-term depression. But I felt better whenever I was in the kitchen. Cooking a week’s worth of oatmeal, cleaning and cutting vegetables for salad, making tea – whatever I was doing in there, it was good for me, even if it was 11 at night and I needed to get to bed as soon as possible. So midlife crisis or not, sheepish #vanlifer though I may be, I had some radish blossoms that needed me. Or that I needed. Radish blossoms, radish greens, radish roots. Use them all in this salad. That was the plan. I bought the various radish items on Wednesday and put them in my 25 year old cooler with some reusable frozen blue blocks. Those things don’t stay cold too long but when I tasted the blossoms two days later they still seemed okay. That afternoon I chose yoga over finding a safe haven where I could slide open the door to Toyota Kitchen Stadium. Saturday was a different story. In the morning I opened the cooler to grab an apple and got a whiff of something not-fresh. In the afternoon I finally got to a busy park’s parking lot where I was comfortable exposing the van’s insides. The radish blossoms were rank. I was disappointed in myself, I hate wasting food. And I loved those things, they’re why I’m writing this right…now, and why you’re reading this right…now. But I had to move on, as I’m sure the radish blossoms would have wanted me to. Life after love exists. The greens from the radishes were toast as well so I cut them off and threw them out. The radishes themselves were not just okay, they were crunchy and delicious. Back on Wednesday right after I bought them I cleaned the radishes thoroughly (in Giuliana’s kitchen, without access to which I wouldn’t have attempted any of this, the radishes were caked in dirt and I ended up washing them in four changes of water). Three days later in the Griffith Park Pony Ride satellite parking lot, I wiped each one off individually to remove any residual radish green. When I was done cleaning them I knocked the container of two dozenish newly-cleaned radishes into my minivan’s garbage can. Fortunately I keep a clean can and I wasn’t serving them to anyone. I picked them out, placed them in Rubbermaidware with some water, shook them up, and wiped them off individually once again, nodding hello to the park rangers who cruised by at a distance, and who circled around to get a closer look at what I was up to. Howdy, sir. Even though I love handling food and enjoy eating by hand as much as possible, because of a lack of easy handwash, I was reluctant to perform the massage. I wasn’t convinced I’d be able to thoroughly clean the oil off my hands. I was imagining lemon oil all over my steering wheel and everything else. I’m a messy enough cook as it is. Salt would have been a good addition but I couldn’t find any in the van, which is sort of crazy to me because I used to carry it around in my bag everywhere, just in case. A friend was exasperated with me recently: “You used to put butter and salt on everything and now I do, and you don’t.” Sorry baby. People change. I stopped using salt last June and my taste buds adjusted – I can now taste sodium in unseasoned vegetables as surely as if I had put it there. I blast my palate with oft-used hot sauces, most of which have salt as one of three or four ingredients. Along with what I take in when eating out, that’s enough salt for my diet. But I would have used sea salt if I had it, for the hard, coarse grains. For exactly the same reason someone would get his hands into a bowl of radishes and oil and herbs – to break it all down so the different components would exude and absorb flavors. Are you kidding me? Another hurdle. I massaged those radishes for a good five minutes and they smelled great – mint and subtle lemon and olive oil. Let’s add some greens. Except that all my radish greens were gone. I had some Trader Joe’s kale in my cooler that was intact but seemed wrong for this salad. I was looking for bright and maybe peppery like arugula, not vegetal like kale or spinach. Time to seek out the next parking lot. (My hand cleaned up well with a cloth dishrag and my skin felt nice afterwards.) At Albertson’s I topped off my eight-gallon water container, bought ice for the retro cooler, and chose a pre-washed chard / spring mix. I tossed the massaged and marinating radishes with some greens. I skeptically added some hemp seed and yeast flakes in lieu of cheese, a common vegan cheese substitute that I didn’t expect to compensate for the umami of Parmigiano, but which I hoped would add a pleasing creamy texture, just like large shards of cheese that’ve been clawed and are shedding. I tasted. Squoze half the lemon I had zested for lemon oil on it – the Pig’s salad had the flavor-amplifying benefit of the cheese’s sodium and lactic acid, and probably additional salt too. I’m not sure it had lemon in it beyond the oil but mine definitely needed an acid jack, and it got one. It was so good it hurt, like a great song. If my minivan were a restaurant I would order the Previa Radish Salad one or two nights a week. It was enough to make me happy to be 44, alive and free, living out of a minivan. It might provide some sort of similar satisfaction for you. Whether you decide to go vegan or reggae (slang for regular in at least one restaurant kitchen), as radishes come into season I hope you tackle and enjoy this grounding, life-affirming salad. If you live in a non-mobile home it should be a straightforward and satisfying primal exercise in washing, slicing, handling, and eating – and hopefully sharing – food. Inspired and nourished by the radish salad at The Spotted Pig. If you’re making lemon oil, use a vegetable peeler to remove the zest from a lemon. Try not to peel off any white pith and if you do, use a paring knife to remove it. Put one cup of olive oil in a coverable container with the lemon zest. Let sit covered for one or two or three days. Wash the radishes in as many changes of water as necessary to remove all the dirt. Swish the radishes around in a large bowl of water, then lift the radishes out of the bowl. The dirt will be left behind if you do it this way (use the same technique for washing greens). If you pour the bowl and vegetables into a strainer much of the dirt will still be present. If the radishes have greens, remove the leaves and set aside to dry on a dish towel. Trim the radishes of their stems and any tails you deem excessively long. Some tails lend more rusticity to an already rustic dish. Cut the radishes into bite-sized pieces. Halves are usually enough. Here we go: put the radishes and the mint in a large bowl. Add 2 tablespoons lemon oil or plain olive oil. If everything is coated, you’re good. If you think you need a little more, add a little more. Add a large pinch of salt (not too much if you’re adding cheese, which is salty; you can add more salt at the end if needed). Get your hand or hands in there and massage the radishes until you’re satisfied. Yes, that’s vague. Don’t clean your hands yet if adding cheese. Add cheese now and massage some more until the parm has broken down enough to make the salad creamy, but leaving a number of bite-sized nuggets. Add the greens and toss gently. Add the juice of half a lemon. I like to squeeze it directly in, using a small strainer to catch seeds. Taste and adjust. If all your ingredients were great, this salad should be awesome. If it’s not and you’re not sure what it needs, start with adding more lemon juice. Lack of acid is often the difference between good and great in otherwise well-prepared dishes. If you feel you’re on the verge of too much lemon, move on to salt and/or cheese and/or hemp & yeast. I’m sure you’ll love it. Bon appetit, and thank you.